Link Wray-1958-1973: The Fifteen Years Between Rumble and The 3-Track Shack. It’s no exaggeration to say that Link Wray was one of the most important, innovative and influential guitarist in the history of modern music. Link Wray influenced Jimmy Page, Neil Young, Iggy Pop, Phil Everly, Bob Dylan, The Beatles, The Kinks, The Who and the Rolling Stones, while his 1958 instrumental hit Rumble, popularised the power chord. As a result, several generations of guitarists owe a debt of gratitude to Link Wray. Despite his contribution to music and his considerable talent, sadly, Link Wray never received the recognition he deserved, and died in Copenhagen, Denmark, on November’5th’ 2005. That day, music lost a true legend. His story began on May 2nd 1929. That’s when Link Wray was born in Dunn, North Carolina, to Fred Lincoln Wray, Sr. and his wife, Lillian M. Wray. Link Wray’s mother was a Shawnee Indian, and later, Link Wray was proud of his heritage. This caused problems for Link Wray when he was growing up. North Carolina in the thirties was Klu Klux Klan country. Life was tough for the Wray family. At nights, the Klan came calling, wearing their white capes and carrying burning crosses. In the local community, African-Americans like Link Wray’s mother feared for their life. They had no option but to hide under their bed, until the Klan left. It was a tough upbringing for Link Wray. To make matters worse, the family were dirt poor. Link Wray’s father had been pensioned out the US Army. His disability cheque allowed the family to survive the depression…just. The house had dirt floors, and didn’t even have electricity. Somehow, though. Link Wray’s mother and father found the money to buy his elder brother Vernon an acoustic guitar. When Vernon showed little interest in his guitar, fourteen year old Link Wray picked up the guitar. Link tried to teach himself, and used to sit in the porch strumming and picking his guitar. Then one day, a member of a passing circus saw Link Wray playing his guitar. Realising the young man was struggling, the stranger, who called himself Hambone, showed him how to tune and then play the blues guitar. He showed Link Wray open chords, and how to play the guitar with his fingers and even a knife. Link Wray watched what was the equivalent of a musical masterclass from Hambone, who was just as comfortable playing drums and horns. Having showed Link Wray how it was meant to be played, Hambone left him playing his guitar. However, every time the circus passed through town, Hambone stopped by, to see how his pupil was progressing. By the time Link Wray was sixteen, he was more than proficient guitarist. He spent a lot of his spare time listening to the blues. Some of the Wray’s neighbours enjoyed the blues, and when they threw open their windows, the music spilled out. As Link sat there, he listened and learnt. For Link, it was part of his musical education, which was going pretty well. He had mastered the guitar, which was just as well, as Link was about to leave school. After a teacher threatened to whip Link Wray, there was a fracas, and the outcome was that he had to leave school. Initially, he got a job delivering groceries and picking cotton and tobacco. This brought some much-needed money into the household. Then in 1947, when Link Wray was eighteen, the his family were on the move. Their destination was Portsmouth, Virginia, where Link Wray’s father and elder brother Vernon got job as pipe fitters at a dockyard. Things were looking up for the Wray family. Especially when long after this, Link got a job as a messenger in the same dockyard. After two years working at the dockyard, and scrimping and saving, Link Wray had enough money to buy his first electric guitar in 1949. He chose a Vega electric guitar, which he purchased from a Sears and Roebuck catalogue. From the moment he bought the guitar, Link Wray practised non-stop. He was determined to improve his technique and playing. However, by 1950, things were looking up for the Wray family. Vernon Wray, Link’s elder brother, had founded his own taxi firm in 1950. He employed his two brothers, Link and Fred as drivers. Not long after he started work as a taxi driver, Link Wray began playing bass in country bands. This made him some extra income until in 1951, he was called up by Uncle Sam. In 1951, Link Wray was called up to serve in the US Army during the Korean War. This almost wrecked Link Wray’s career. Whilst serving in the US Army, Link Wray contracted T.B. Somehow, nobody realised this and it didn’t become apparent until well after Link Wray left the US Army. On leaving the US Army in 1953, Link Wray’s thoughts turned to music. He was even more determined to make a career out of music, and on his return home, Link Wray bought a new Les Paul guitar and amplifier. It was then his brother Vernon, suggested they form their own band, The Lazy Pine Wranglers. The nascent group featured Vernon on vocals and rhythm guitar, Link on lead guitar, steel guitarist Dixie Neal and Brantley “Shorty” Horton on stand-up bass. Soon, what was Link Wray’s first group, was a popular draw in the nearby city of Norfolk. While The Lazy Pine Wranglers were the Wray brothers first group, it wasn’t their last. Link’s brother Doug got a job playing drums and guitar for the Phelps Brothers. They had been really successful on the country circuit, and featured in westerns alongside Roy Rogers. The Phelps Brothers also owned the nearby Palomino Dude Ranch. Somehow, Doug managed to swing a regular gig for the Wray brothers there. As Link Wray and The Palomino Ranch Gang, they provided a country tinged soundtrack at the Phelp Brothers’ ranch. This gave the Wray’s career a boost. Soon, they were backing Tex Ritter, Lash La Rue, Sunset Carson and Wild Bill Elliot. Link Wray and The Palomino Ranch Gang even found their way onto WCMS’ radio’s Hillbilly Concert Hall. This lead to a spot on WMAL-TV’s late night country program Town and Country. With WMAL-TV based in Washington, the Wray brothers moved their permanently, hoping that this would further their career. It did, and in 1956, Link Wray released his debut single. By then, he was billed as Lucky Wray, and released It’s Music She Says on the Texan independent label Saturday. The followup was Whatcha Say Honey. Both singles showcased a talented singer. However, just as it looked liked Link Wray’s star seemed to be in the ascendancy, tragedy struck. Link Wray became ill. Initially, the doctors diagnosed pneumonia, and he spent a year in hospital. During this period, Link Wray had to have a lung removed. The doctors that treated him thought that Link Wray would never sing again. A determined Link Wray proved them wrong. Early on in 1957, Lucky Wray released another single, Teenage Cutie, which was the last single Link released as Lucky. His next release marked the debut of Link Wray. This came on an E.P. featuring Bob Dean and Cindy With The Kountry Kings. Both acts featured two tracks. Link Wray supplied two of the four tracks on an E.P., I Sez Baby and Johnny Bom Bonny. They saw Link combine country and rockabilly. There’s more than a nod to early Elvis Presley recordings on the songs that launched Link Wray’s solo career. By then, two the Wray brothers were trying to forge a career as singers. Vernon was signed to Cameo, and released a couple of unsuccessful singles. During one of Vernon’s recording sessions, Link was watching proceedings and when the session finished early, Bernie Lowe allowed Link to record two tracks he had written, Oddball and Swag. When Link heard the playback of Oddball, he knew in his heart, that the song was special. He smiled inwardly, knowing that the session at Broad and Locust, in Philly, cost just $75. For that, Bernie Lowe worked as tape-op. Little did anyone know how much of a bargain it had been. However, Link struggled to get anyone interested in the song. He played it on Milt Jackson’s show. Wanting to help his friend, Milt even took a copy to Archie Blayer at the Cadence label. Archie Blayer didn’t like the raucous sounding track, so gave his copy to his teenage step-daughter Jackie Ertel. She however, loved Oddball, and encouraged her father to release the track. The only thing that Jackie didn’t like, was the name. She suggested that Oddball be renamed as Rumble. History was about to be made. In April 1958, Link Wray and His Ray Men released what would become Link Wray’s most successful single, the classic instrumental Rumble. It saw Link Wray deploy distortion and feedback. This was a first, in more ways than one. Link Wray also became one of the first guitarists to use the power chord on Rumble. He wouldn’t be the last, and since then, it’s been part and parcel of many a guitarists arsenal. When Rumble was released as a single, immediately it was banned by the authorities. Link Wray had just made history, as Rumble became one of the first instrumentals to be banned. The problem was the title. Rumble was the slang term for a gang fight, and the authorities feared that the single would lead to disorder. Ironically, banning Rumble made the song even more popular. Some nights, Link Wray and His Ray Men played several encores of Rumble. Rumble was popular on both sides of the Atlantic. It reached number sixteen in the US Billboard 100 charts. Across the Atlantic, future members of The Kinks and The Who heard this classic instrumental. Other musicians were won over by it. From Bob Dylan to Phil Everly, Rumble was a favourite of musicians everywhere. After the success of Rumble, many thought that Link Wray would become one of the biggest stars of the late-fifties and sixties. That proved not to be the case. Things looked good at first. Archie Blayer sent Link Wray and His Ray Men to record the followup. He suggested a track called Dixie Doodle, which was Duane Eddy-esque. However, Link preferred the other track they cut Raw Hide. Link Wray released Raw-Hide as a single in January 1959. It reached number twenty-four in the US Billboard 100 charts. After that, Comanche a song Link Wray named after his North American Indian roots’ failed to chart. Neither did Slinky nor Vendetta. The rest of 1959 was a right-off. Sadly, so was 1960. Neither Trail of the Lonesome Pine, nor the Jimmy Reed penned Ain’t That Lovin’ You, Baby charted. Things weren’t looking good for Link Wray. To make matters worse, he was about to release released his debut album Link Wray and The Wraymen later in 1960. When it was released, it too, failed commercially. Link Wray’s career had stalled. Luckily, Vernon Wray realised the importance of looking after his brother’s finances. Having secured funding from Milt Jackson, the Wray brothers setup a two room studio opposite WTTG, where Milt’s show was broadcast. From that studio, Vernon looked after Milt’s publishing and composing rights. The company that took care of the publishing, was Vernon’s Florentine Music. This proved a shrewd move. When the hits dried up for Link Wray, he had a nest egg to fall back on. However, in the summer of 1961, it looked as if things were starting to improve for Link Wray. In July 1961, Link Wray released Jack The Ripper as a single, and it reached number sixty-four in the US Billboard 100 charts. This just a minor hit single, and was a long way from 1958, when Link Wray launched his career with Rumble. Over the next few years, Link Wray continued to release singles and a few albums. Link Wray released his sophomore album Great Guitar Hits by Link Wray, in 1962 and then Jack The Ripper in 1963. By then, Link Wray was struggling. Money was tight, and he was living in a small flat in Washington. He paid for this out of the small wage his brother paid him. Meanwhile, Vernon was making plans. Vernon bought a house situated in five acres of Land in Livingston Road, Accoceek. After this, he started to buy good quality recording equipment that was being sold cheaply. The equipment took pride of place in the recording studio in Vernon’s basement. This was where Ronnie Dove recorded all his hits. Soon, the word was out that Vernon Wray’s studio was the best studio in town It was also where the Wray family gravitated, and in few years, this included Link, whose career was about to stall. 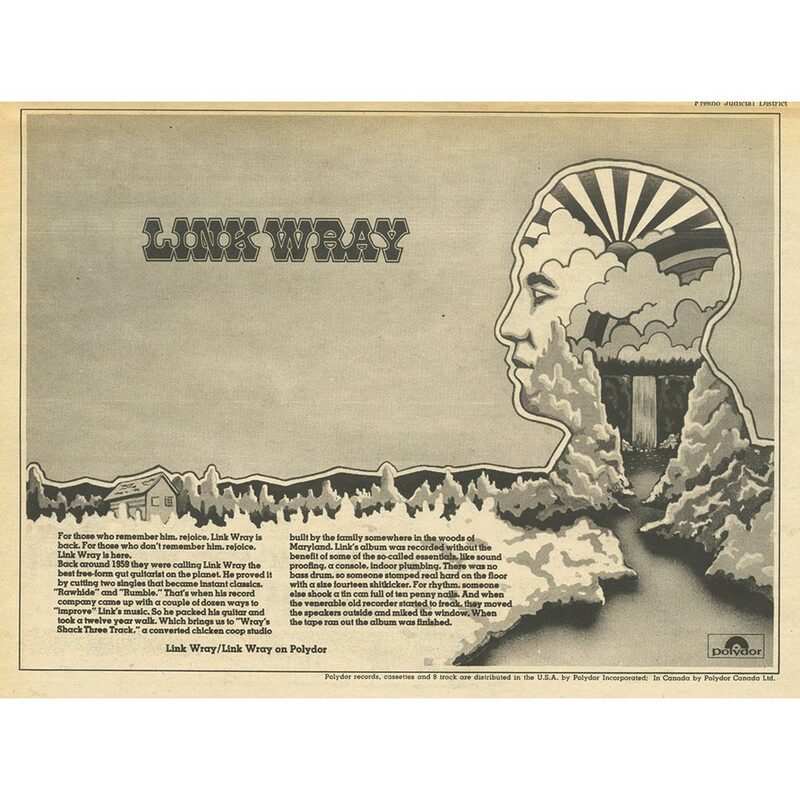 Link’s final album of the sixties was Link Wray Sings and Plays Guitar, which was released in 1964, just as the British Invasion hit America. Suddenly, Link Wray fell out of fashion. After that, Link Wray sporadically released singles right up until 1966. However, still he continued to tour. Mostly, though, the tours took Link Wray into the North Eastern states. During this period, Link Wray and His Wraymen’s lineup is best described as fluid. Despite the changes in the lineup Link Wray and His Wraymen were still a reasonably popular draw. However, Link Wray was no longer selling records. Eventually, though, Link Wray tired of touring. All the months and years he spent touring had taken its toll on Link Wray, and in 1970, the forty-one year old decided to stop touring. Having stopped touring, Link Wray made his way to Vernon’s farm, which became his home. However, Link hadn’t stopped making music. He played in local bars, and practised at home. That was until his wife Evelyn tired of the music coming from the basement. Link Wray decided to move his recording studio from the basement to 3-Track Shack, where his next three albums were recorded. Initially, Link Wray believed that the first of in this trio of albums, Link Wray, was going to be released on The Beatles’ Apple label. Certainly, Apple’s New York representative sent someone down to Vernon’s farm to meet Link Wray. They told Link Wray that The Beatles it seemed were big fans of his music. With the Fab Four on his side, things were looking good for Link Wray. As the talks commenced, it quickly became apparent that if Link Wray was released on Apple, it was going to be a lucrative deal. For Link Wray, who had found the past few years difficult financially, his looked like being a godsend. Buoyed by this news,Link Wray got to work. A total of eleven tracks were chosen for what became Link Wray. His drummer Steve Verroca wrote five of the track, while another five came from the pen of Link Wray. The track that closed Link Wray, was a cover of Willie Dixon’s Tail Dragger. These eleven tracks were recorded by Link and his band in the old chicken shack. The band featured drummers and percussionists Steve Verroca and Doug Wray. Pianist Bill Hodges also played organ, while Bobby Howard switched between piano and mandolin. Along with the rest of the band, Gene Johnson added backing vocals. Link Wray sung lead vocals and played bass, guitars and dobro. As the recordings took shape, all Link Wray could think about was that he was about to sign to The Beatles’ label. That didn’t happen. After a meeting in New York, Vernon Wray came back with bad news. Link Wray was going to be released on Polydor. This was a huge disappointment for Link Wray. However, at least, he had a recording contract, which was the main thing. Before the release of Link Wray in June 1971, the critics had their say. Many used to his earlier work, weren’t impressed by Link Wray’s new sound. It was a mixture of Americana, blues, country rock and folk rock. However, what impressed many critics, were the songs Link had written. They were autobiographical, and had an honesty. Since then, Link Wray has been reappraised by critics, who appreciate the lo-fi, honesty of this genre-hopping albums. However, Link’s fans didn’t. On the release of Link Wray, his fans weren’t impressed by the album. They were shocked by the change of style. Link Wray remarked at this: “in a way I couldn’t care less if the album didn’t sell a single copy. We’re happy with it and we’ve done it our way.” His fans seemed not to noticed music had changed since Rumble, Raw-Hide and Jack The Ripper. As a result, Link Wray stalled at number 186 in US Billboard 200. Although this was disappointing Link was back, back at the Shack recording his next album, Mordicai Jones. Just like Link Wray, Link and Steve Verroca wrote most of the album. This time however, they cowrote seven of the tracks. They also cowrote The Coca Cola Sign Blinds My Eye and On the Run with Bobby Howard, who used the alias Mordicai Jones.The other track was a cover Roy Acuff, The King of Country Music’s Precious Jewel. These tracks were recorded at the 3-Track Shack. This time around, Steve Verroca took charge of production. The lineup of the band was similar to the one that recorded Link Wray. Drummers and percussionist Steve Verroca joined bassist Norman Sue and joined rhythm guitarists Doug Wray and John Grummere in the rhythm section. They were joined by organist and pianist Bill Hodges. Pianist and mandril player Bobby However, adopted the alias Mordicai Jones and a lead vocals. Ned Levitt added backing vocals, hand-claps and foot-stomps. Meanwhile, Link played bass, guitars and dobro on Mordicai Jones. It was released later in 1971. Stylistically, critics noted, that Mordicai Jones was similar to Link Wray. It comprised the same musical elements. Mordicai Jones was a mixture of Americana, blues, country rock and folk rock. The music has a laid back, pastoral vibe. Other times, there’s a tougher edge. However, critics felt what made a difference were the vocals. TB had long ago ravaged Link Wray’s voice and given it the rough, tough, some would say guttural sound. Unlike the mysterious Mordicai Jones. Bobby Howard’s vocals were heartfelt and impassioned. He sung about “going back to the land,” and what many people see as a simpler way of life. 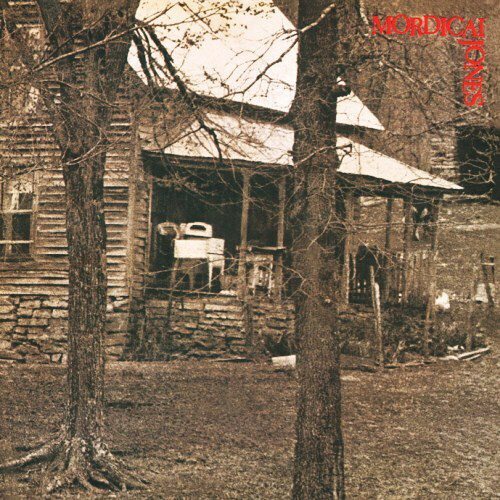 One critic went as far as to describe the music on Mordicai Jones as sounding as if it were made “by folks who actually worked the farm they lived on.” Critics still hadn’t forgiven Link Wray for changing direction musically. Comments like that didn’t do Mordicai Jones album justice. They certainly didn’t help sales of Mordicai Jones. On the release of Mordicai Jones, the album failed to chart. After the commercial failure of Mordicai Jones, Link Wray was in for a shock. In 1972, Link’s brother Vernon decided to move to Tucson. He packed up his belongings, and took the back wall of the 3-Track Shack for good luck. As the three brothers said their farewells, Doug asked for his share of the money. Vernon explained there was no money. All the money had been put into the studio. This was the end of Wray brothers partnership. The three brothers never worked again. Later, when Link Wray decided to ask Vernon about the money, Vernon replied that he received all the glory. There was an uneasy silence. By then, Vernon had a new eight-track studio up and running in Tucson, Doug opened a barbershop and Link Wray recorded Beans and Fatback. Beans and Fatback was the last album in the 3-Track Shack trilogy. Just like the two previous albums, Link Wray and Steve Verroca wrote most of the tracks. They cowrote eight of the eleven tracks. The other three tracks, Georgia Pines, In The Pines and Take My Hand, Precious Lord were traditional songs. 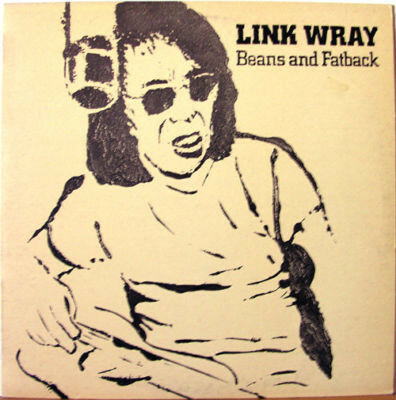 In The Pines was reworked, courtesy of a new arrangement by Link Wray and Steve, who produced Beans and Fatback. The band had recorded Beans and Fatback in the 3-Track Shack in 1971. 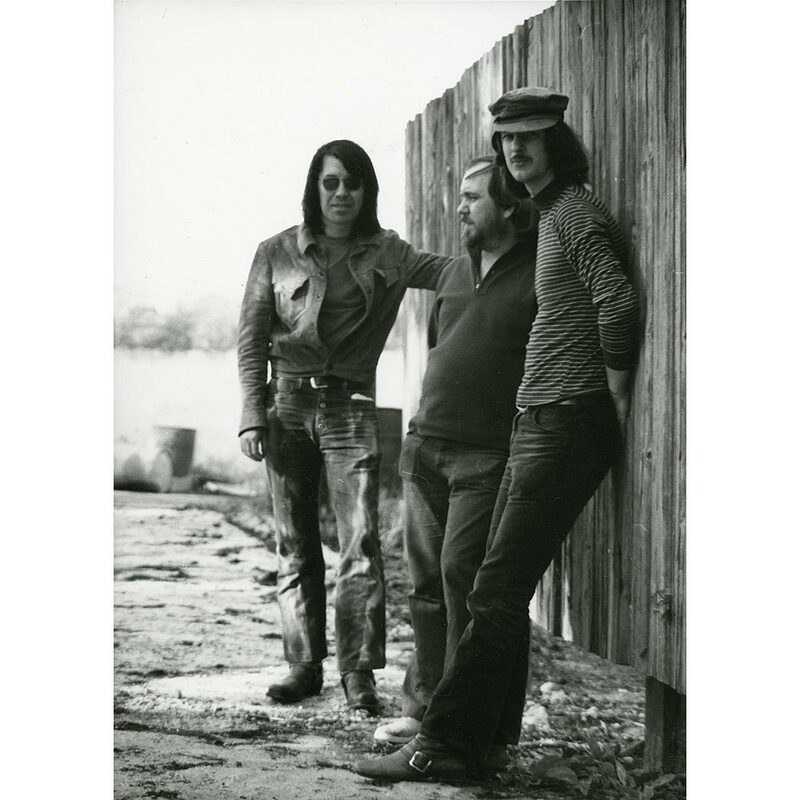 Back then, the rhythm section featured drummer and percussionist Steve Verroca, rhythm guitarist Doug Wray and Link Wray played bass, acoustic, electric, steel and 12-string guitar. Link Wray also played dobro and took charge of the vocals. Pianist Bill Hodges played organ while pianist and mandolin player Bobby Howard revived his alter ego Mordicai Jones. Together, they played harder and faster than on the first two albums on the 3-Track Shack trilogy. Once Beans and Fatback was complete, the search began for a record company who were willing to release the album. Eventually, Virgin Records agreed to release Beans and Fatback. By then, producer Steve Verroca was working for Virgin Records, and was producing Kevin Coyne’s album Marjory Razorblade. Steve it seemed, had championed Link Wray’s cause. He knew what the album sounded like, having played and produced the album in 1971. Unlike anyone else he knew that Link Wray had changed direction again. As copies of Beans and Fatback landed on the desks of critics, they were in for a surprise. The album had a tougher, rougher edge. A hard rocking, sometimes almost raucous, rowdy band worked their way through the eleven tracks combining rock ’n’ roll, Americana, blues and country rock. There was more than a nod to the instrumentals that launched Link Wray’s career. Link Wray was back, and better than ever. Sadly, nobody realised this. When Beans and Fatback was released in 1973, the album failed to chart. The last instalment in the 3-Track Shack had failed to find the audience it so richly deserved. It would only be later that the 3-Track Shack trilogy found an audience. As the years passed by, there was an upsurge in interest in Link Wray’s music. Especially, the trio of albums recorded by Link Wray at the 3-Track Shack. Link Wray, Mordicai Jones and Beans and Fatback were hidden gems in Link Wray’s discography, and thankfully, the three albums have been reappraised, and have being championed by a new generation of musicians. Just like The Beatles, The Kinks, The Who and Rolling Stones, this new generation of musicians are flying the flag for Link Wray and the 3-Track Shack trilogy. These albums show two sides of Link Wray. The first two albums, Link Wray and Mordicai Jones, have a much more laid-back sound, and showcase a fusion of Americana, blues, country rock and folk rock.By contrast, Beans and Fatback, the final instalment in the 3-Track Shack trilogy, has partly been inspired by Rumble. It finds Link Wray and his band kick loose, and unleash a much more rowdy, raucous, rock ’n’ roll sound. 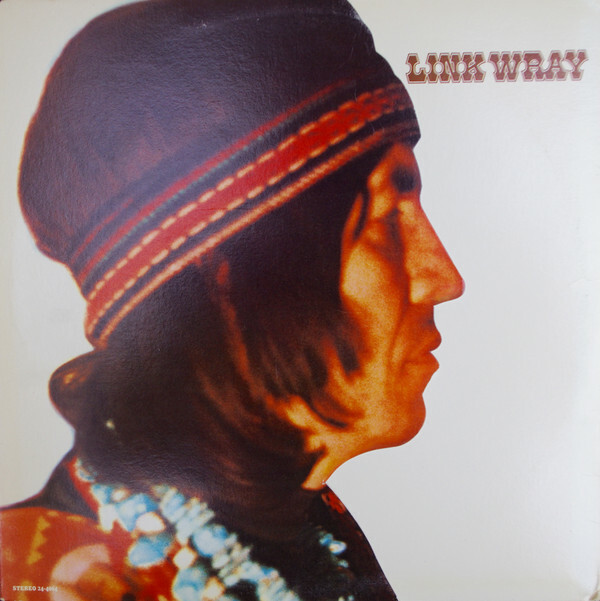 There’s still diversions via blues and country rock, but mostly, the old Link Wray shines through. While this should’ve pleased his fans, they turned their back on Beans and Fatback when it was released in 1973. They didn’t realise what they were missing. While Link Wray’s music is starting to find a wider audience, it’s also starting to receive the recognition it deserves. Somewhat belatedly, Link Wray is receiving the recognition as a musical pioneer, and one of the most influential guitarists in the history of popular music. He popularised the power chord, and inspired everyone from Jimmy Page, Neil Young and Iggy Pop to Bob Dylan, The Beatles, The Kinks, The Who and Rolling Stones to Phil Everly. They were all influenced by Link Wray whose career spanned six decades. Sadly, Link Wray passed away in Copenhagen, Denmark, on November 5th 2005 aged seventy-six. By then, his music was starting to find a wider audience and receiving the recognition it so richly deserves. Especially the music that Link Wray recorded and released between 1958 and 1973. This was one of the most important period in Link Wray’s long and illustrious career. It started with the biggest hit single of his career, Rumble, and ended with the release of the trilogy Link Wray recorded at 3-Track Shack trilogy. These three albums recorded at the 3-Track Shack feature some of the best music of Link Wray and are a reminder of one of the most important and influential guitarists in the history of popular music. ← THE LIFE AND TIMES OF RADKA TONEFF.